Home - Collins Land Services, Inc.
Collins Land Services, Inc. located in Tallahassee, Florida is dedicated to providing you the services you need when you need them. Serving Leon and surrounding counties. We are an American Owned, Veteran Operated company located in Tallahassee Florida. 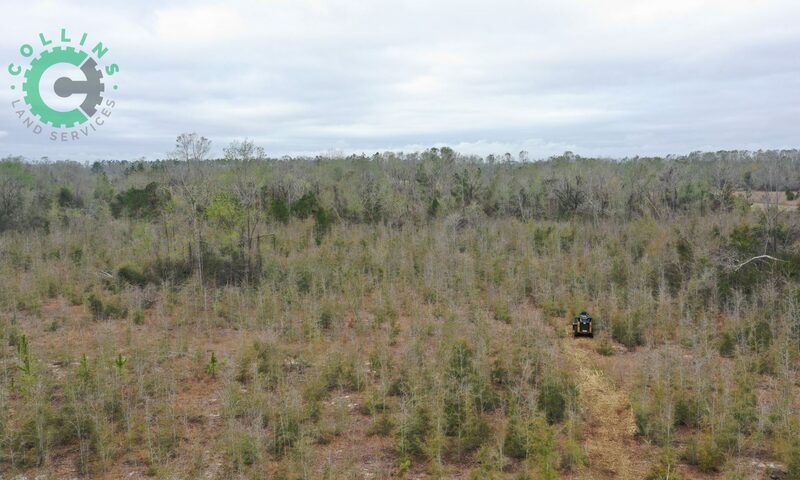 Our goal is to provide residents of Tallahassee, Florida and surrounding areas professional land management options. Some of the services we provide are land clearing, forestry mulching, stump grinding and removal and retaining wall design and installation. We also provide a full line of general tractor services from field mowing to disc harrow and seeding to preparing new pastures. We provide prompt professional written estimates. Estimates are always free and we will not pressure you into services you are not interested in. If we don’t offer a service you need we will gladly recommend a company to you that can provide what you need. Could not be happier with the service provided! Edwin and his crew were prompt, professional, and did their best to get our trees and land cleared and mulched. Excellent service! Great service, beginning to end. Edwin and Brandi are both super professional. The guys who did my work were personable, polite and hard working. I highly recommend their company. Classy, motivated, and just all around good people, Owners Edwin and Brandi are. If you need any sort of land clearing, underbrush removal, maybe your back yard has damaged or older weakening trees; Give them a call! Great prices and willing to do what it takes to get your business. We found Collins tractor service while browsing through the Facebook market place and messaged him for a quote to clear the property lines on 5 thickly wooded acres. He quickly responded to my message and we had a quote immediately. We were able to schedule the work right away. His operator was running behind because of GPS issues but contacted me to let me know so I didn't have to wonder. He was courteous and professional and did a great job not only clearing the property lines but some additional trails as well. The operator took pride in his work and took very good care of the equipment. Probably why we had no equipment issues that required rescheduling and no down time. The price I paid was exactly what was quoted with no extra fees. I would recommend them for any services that they provide and I will definitely be using them in the future!! Great service and reasonable prices. These guys communicate well. Do what they say they’re going to do when they say they’re going to do it. Great company. Excellent crew. Shane did a fantastic job and was very receptive to my evolving needs on my project. Would recommend Edwin and his crew 110%. Copyright © 2019 Collins Land Services, Inc.. Proudly powered by WordPress.